Laundry is inevitable. And unfortunately that dirty clothing is not going anywhere until you deal with it. But let’s admit it – there are few things better than fresh bed sheets so it’s all worth it in the end. Since you’ll be facing your dirty hamper time and time again, here are some ways to approach your laundry with a sustainable mind. 1) Invest in a washing machine and dryer with an Energy Star label. These certified machines use 37% less energy and 50% less water than regular machines, creating an economical and sustainable combination. What could be better than that? 2) Wash clothing with cold water. 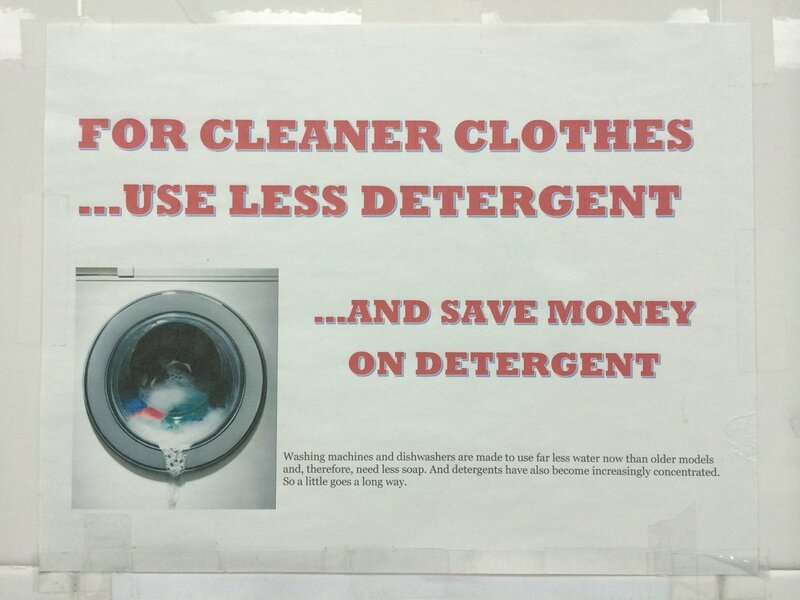 Not only does using cold water save energy, it’s better for your laundry. Cold water will keep your colors bright, won’t set stains and will reduce wrinkling. 3) Run full loadsand clean out the dryer’s lint filter between uses. Taking proper care of your machines and making sure you’re fully utilizing each washing cycle are good laundry habits to establish. 4) Sort dirty laundry as you throw it into the hamper. Using a 3-bag laundry hamper will cut out the sorting step and save you time when taking care of laundry. Separate whites, colors and delicate clothing as it enters the hamper. 5) Toss one or two tennis balls into your dryer. Tennis balls will help circulate air between clothing thereby reducing the amount of time needed to fully dry clothing. In case that’s not enough, the balls serve as fabric softeners and can be used again and again. 6) Replace bleach with lemon juice. Adding ½ cup of lemon juice to the washer cycle will brighten up whites and keep them fresh. Say goodbye, bleach. 7) Use less laundry detergent by adding baking soda. Cut down on detergent consumption by adding ½ cup of baking soda to each load. Baking soda works to keep colors bright and remove odors from clothing. 8) Make your own dryer sheets. Soak an old washcloth or hand towel in liquid fabric softener and let it dry completely. Throw it in your next dryer load as a replacement for fabric softening sheets. You can reuse it for about 40 loads, reducing lots of unnecessary waste. 9) Fold clothing right away to reduce wrinkles. Avoid leaving freshly laundered clothing in a mound and fold your clothing while it’s still warm. This will help reduce wrinkles and the amount of ironing needed. Get those sheets back on your bed immediately to assure a crisp look. A version of this post was first published on the Honestly blog.